The Wembley, previously known as St. Giles Wembley, is 4-star hotel along Magazine Road (Jalan Magazine). Managed by CHM Hotels, The Wembley is the sister property of Cititel Penang, which is located approximately a kilometer away. Wembley Cafe is the former hotel's all-day dining restaurant. Wembley Cafe is decorated with beautiful Christmas ornaments to embrace the year-end festive spirit. 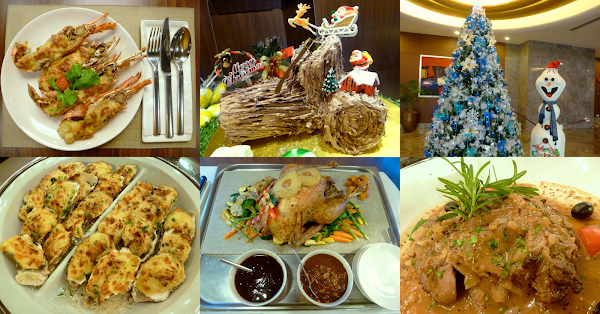 In addition, this 24-hour coffeehouse is having several yuletide-themed buffet sessions around Christmas and New Year. The special menu features a number of classic Western dishes as well as several handpicked Asian ones. Of course, it wouldn't be Christmas without any Roast Turkey. Loaded chestnut stuffing, the turkey is marinated with spices and roasted to golden perfection. Also contributing to flavor are buttered vegetables like Brussels sprouts, asparagus, broccoli, carrots, squash, sweet potato and pineapple. As for condiments, giblet and cranberry sauces go well with the turkey. Lobster Thermidor is an exquisite delicacy from the marine kingdom. Scrumptious lobster meat is first mixed with egg yolk, cheese and mustard. The mixture is stuffed back to the shells, and then baked with a golden cheese crust. Overall, I cannot ask for a more perfect dish. As for red meats, Beef Tenderloin is lightly smoked and then roasted. Served in beef au jus, I enjoy the juicy beef very much. The same can be said for the Rosemary Lamb Leg. Succulent slices of lamb are served in an aromatic gravy made from rosemary and garlic. The dish is also garnished with rosemary for aesthetic appeal. Moving on to poultry, Chicken Galantine uses deboned chicken that is made in cylindrical shapes. The chicken is coated in aspic, which is easily mistaken as yellow chicken skin. This French dish is garnished with roasted sweet potatoes and diced tomatoes, and is served with chicken stock gravy. Sautéed Salmon is another enticing dish. Filleted salmon is topped with green sauce made from pesto and avocado, presenting a cooling sensation in the mouth. The next dish is Oysters Au Gratin. Covered in spinach and cheese, the oysters are sufficiently shielded from becoming too dry. This scrumptious treat is an alternative choice for people who do not consume raw shellfish. At the Asian tapas section, there are fried radish cake (炸萝卜糕), stuffed crabs (酿蟹), century egg rolls (皮蛋卷) and fried money bags (炸福袋). Satay (skewered meat) is available in beef and chicken versions. Upon request, the roast meats (烧腊) section prepares succulent cuts of roasted duck (烧鸭), roasted chicken (烧鸡) and barbecued chicken (叉烧鸡). Boiled chicken (白斩鸡) and oily rice (油饭) are also available. Condiments include duck sauce, spicy soy sauce, garlic & chili sauce and ground ginger. Diners who fancy chilled seafood can savor various kinds of marine delicacies like snow crabs, spanner crabs, oysters, scallops, mussels, baby octopus, crayfish and shrimps. Chilled seafood is typically eaten with aioli, Tabasco sauce or lemon juice. In addition, the action counter serves à la minute sautéed seafood. The Wembley's Christmas menu also covers a decent variety of sushi (寿司), mostly of nigiri (握り) and gunkan (軍艦) types. Meanwhile at the sashimi (刺身) platter, diners can enjoy fresh slices of salmon (サーモン), tuna (マグロ) and octopus (タコ). Seasoned jellyfish (中華クラゲ) and seasoned baby octopus (中華イイダコ) are also available. This evening's buffet showcases an assortment of canapés and appetizers. Interesting choices are coffee gravlax, smoked salmon, smoked duck and shrimp cocktail. Moving on to cheese, there are four types of gourmet cheese today: Swiss Cheese, Gouda Cheese, Blue Cheese and Camembert. Bread loaves, bread rolls, crackers and grapes are meant to go with cheese. Two types of soup are prepared this evening: Lobster Bisque and Chicken Consommé. The latter is stewed from ground chicken, vegetables, tomatoes and egg white. After simmering for hours, egg white causes the soup's solids to congeal near the soup's surface, which is then skimmed off. What remains behind is a yellowish clear soup. Despite its unassuming appearance, the Chicken Consommé is very flavorful indeed. Constructing Gingerbread House is an annual Christmas affair especially in Europe. Assembled from sheets of gingerbread, the house is decorated with asparagus, icing sugar, marshmallows, jelly candies and M&M's. I notice that the Gingerbread House is left untouched because most people are unwilling to ruin a fine piece of art. Christmas Yule Log is another prominent cake at the pastry section. Swiss rolls are arranged to resemble an actual yule log. In addition, chocolate icing is raked with a fork to mimic the rough texture of bark. Other Christmas pastries are Christmas Pudding, Stollen, Fruit Cake, Red Velvet Cake and Black Forest Cake. Diners who prefer something drier can try a variety of buttery Christmas cookies in airtight jars. Other notable desserts this evening are apple streusel, tartlets, jellies and mochi (餅). At the fruits counter, fresh pitaya (dragon fruit), pineapples, apples, oranges, papaya and watermelon help to cleanse the palate after a hearty feast. Some of these fruits are also available on skewers, making them perfect for dipping in chocolate fondue. As for drinks, Pineapple Juice and Red Berries Iced Tea are effective thirst quenchers. 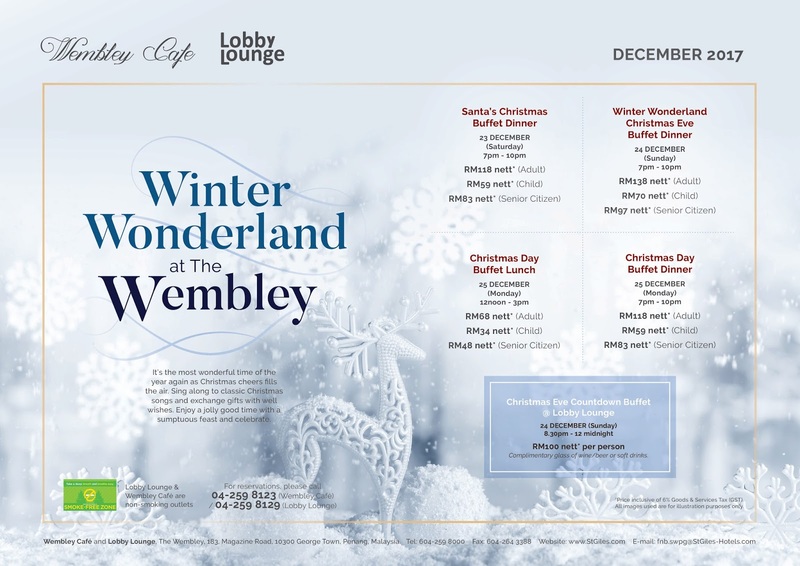 Wembley Cafe offers 4 buffet sessions around Christmas and another 3 more around New Year. 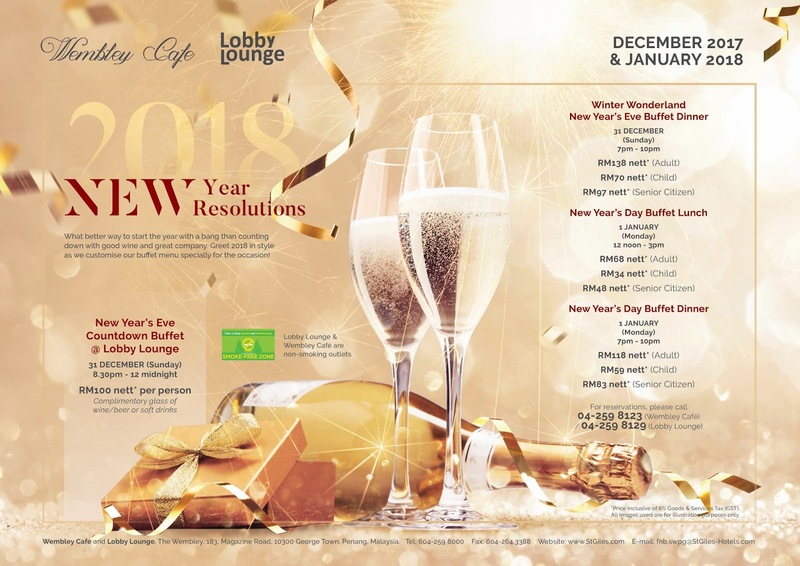 In addition to these buffets, the Lobby Lounge is also hosting countdown parties on the evenings of Christmas Eve and New Year's Eve.